Ireland defender Matt Doherty and manager Martin O'Neill. 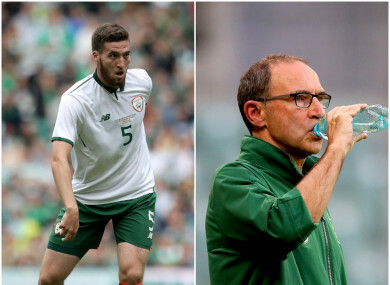 MATT DOHERTY HAS said that he is keen to win over Ireland manager Martin O’Neill, with the Wolves defender still yet to earn his first start for his country despite playing regularly in the Premier League. Doherty has started all four of Wolves’ league games this season, against Everton, Leicester City, Manchester City and West Ham United and was a constant under manager Nuno Espírito Santo during their successful promotion from the Championship last season. The 26-year-old has earned three appearances off the bench as a substitute for the Irish senior team under O’Neill, but has yet to be named in the starting eleven. This trend continued during Ireland’s recent meetings against Wales and Poland, with the defender still keen to impress so he can feature more prominently in the green jersey in the future. “I’ve been around the squads since 2016, but I’ve only picked up three caps coming off the bench for a few minutes towards the end,” Doherty said speaking to The Sunday Times’ Paul Rowan. The Wolves man added that O’Neill has looked for the Dubliner to attack more, after firstly critiquing his defending when he first entered the international scene two years ago in 2016. Email “'Sometimes your face doesn't fit and mine doesn't at the moment,' says Wolves defender Matt Doherty”. Feedback on “'Sometimes your face doesn't fit and mine doesn't at the moment,' says Wolves defender Matt Doherty”.